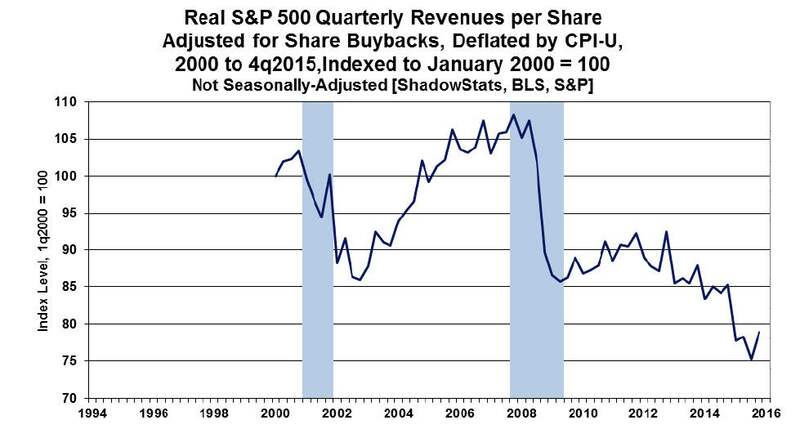 How can the Stock Market Continue to Increase even as Corporate Profits Do Not? Because people are paying more for flat profits. In 2011, two years into the current recovery, the stock market traded at about 10.7x projected corporate earnings. At that time investors were worried about Greece, Portugal and the US debt downgrade. Since then optimism has improved – even in the face of deteriorating corporate profits as investors are now paying almost 17x projected earnings. That the stock market has become very pricey is evidenced by the red line crossing successive higher blue lines in the chart below. Each blue line illustrates market “priceiness” e.g., lower blue lines represent a cheaper market. This illustrates that the stock market increase is more due to investors paying up for stagnant profits (red line intersecting higher blue lines) rather than improving fundamentals e.g. higher corporate profits. Not a healthy nor sustainable situation. 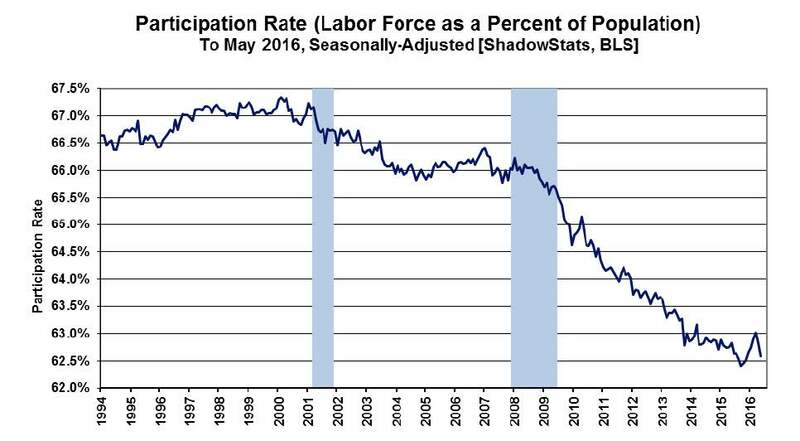 Why are Corporate Revenues Stagnant if the Unemployment Rate is Declining? Corporate revenues are impacted by the 90 million people of working age who do not have a job because they are not seeking one. This dynamic, because this group is not counted as being in the labor force, results in declines in the official unemployment rate though there is no commensurate spending growth. If your income is dependent upon spending down your assets and or transfer payments from the government then you are apt to be quite cautious in what you spend. Thus, the official unemployment rate continues to decline yet corporate revenues do not reflect this “positive” trend. This disconnect may be due to changes in how the unemployment rate is measured. In 1994 the Bureau of Labor Statistics (BLS) changed its system for estimating unemployment. In the new post-1994 system the measurement of individuals who had given up looking for work was removed. The new system was instituted just at the time the North American Free Trade Agreement (NAFTA) was passed and a cynic might say this had the benefit (to the government) of not counting workers who would soon be displaced in the official unemployment rate. While these individuals were removed from the official BLS unemployment estimate, their impact is reflected in the labor force participation rate -- that measures individuals who are either working or are looking for a job as a percentage of the working age population. While somewhat of a mundane economic measure it reflects changes in consumer buying. Is a measure of industrial output and includes: auto production, mining, utilities, oil/gas extraction and other manufacturing. 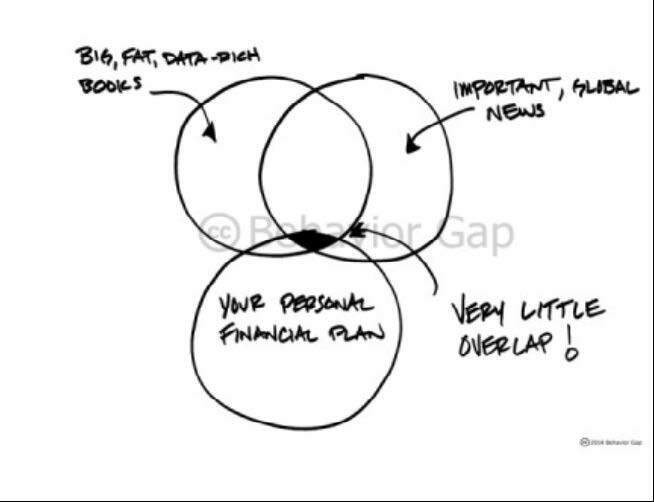 Is very sensitive to changes in consumer demand e.g. if people are not buying cars auto production is curtailed. 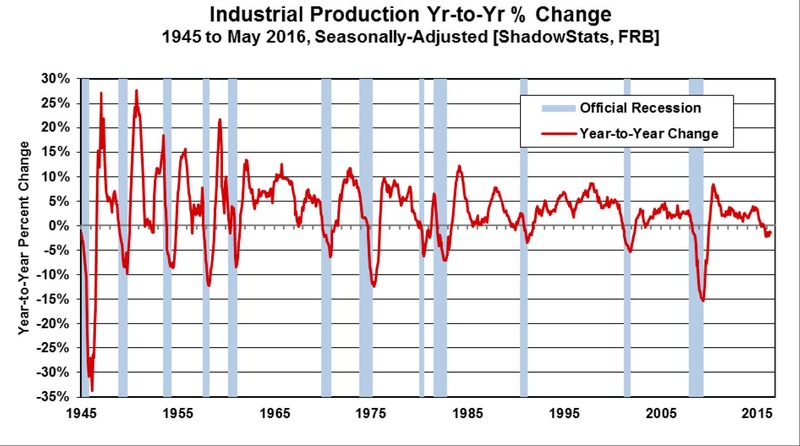 Each and every recession since 1945 was preceded by downturns in Industrial Production. May 2016 industrial production declined -1.4% vs. May 2015. Barring a dramatic turnaround in the June figure second quarter industrial production will also be negative vs. second quarter of 2015. Historically such declines only have occurred in recessions. Were You Worried after the Brexit Vote? Because you heard something on television or read it on the Internet?